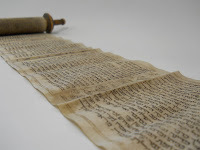 The Robert D. Farber University Archives & Special Collections Department at Brandeis University houses 177 Jewish ceremonial objects, as well as rare Israeli coins and books on Judaica and Jewish ceremonials, given by Bernice and Henry J. Tumen in 1981. 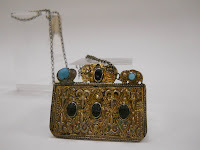 The collection principally showcases nineteenth- and twentieth-century religious artifacts, although it also contains Roman glass and clay pieces from the first to the fourth century. The ceremonials in the collection originate from many parts of Europe and the Near East, as well as areas of North Africa and America. 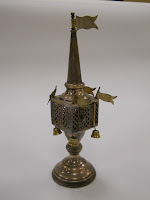 The collection grants researchers direct “confrontation with objects embodying Jewish culture and history,” and attests to the Jewish importance of the prescription of ritual needs.1 Individually, these items illustrate the significance of the use of beauty in the performance of commandments and serve as tangible witnesses to the love of God and Torah. Collectively, they illuminate the communities and environments that informed, challenged, and stimulated their creation and application. 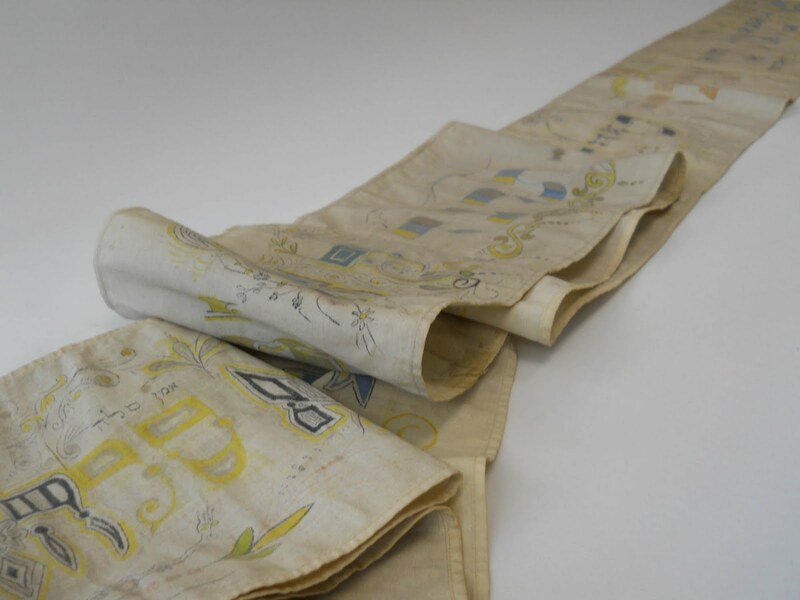 The history of Jewish ceremonial art and objects expresses itself within the historical experiences of Jews living among diverse cultures in dynamic and complex lands. 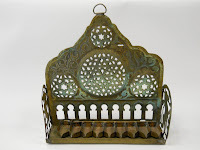 As Jews constructed and understood their religio-cultural identities, they did so as a minority group that attempted to reconcile traditional religious duty with a surrounding folk-art influence. The works of Jewish ceremonial art in this collection reflect this tension and illuminate the artistic expression that blossomed under the constraints of fulfilling the requirements of Jewish Law. This yearning for holy beauty on earth continued with the emergence of Kabbalah, Jewish mysticism, as one finds amulets and talismans growing in popularity. 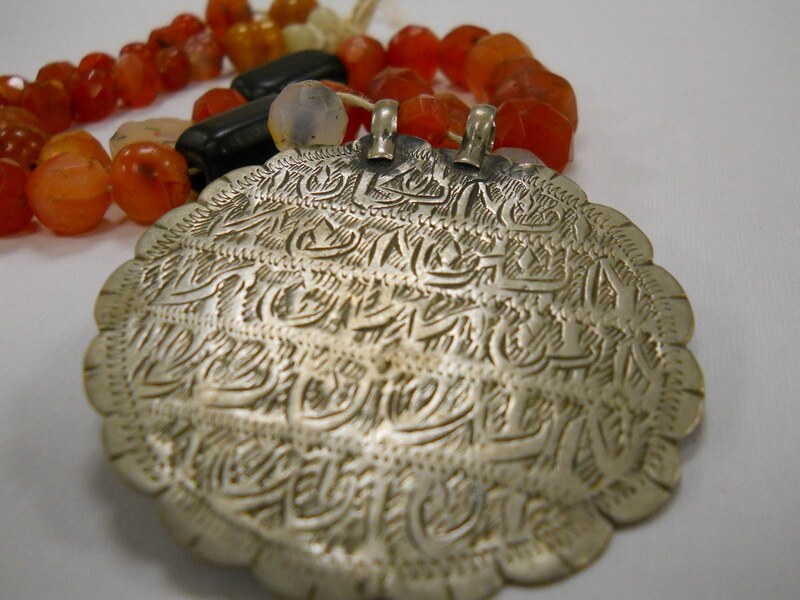 Jewish amulets, emphasizing religious texts and names, were worn for purposes of protection (against sickness, misfortune, and the “evil eye”). 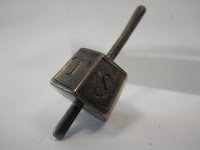 Many of the pieces in this collection can be worn as an ornament and contain the word Shaddai or the Hebrew letter shin. It should be noted that while amulets were quite popular among the medieval European and early modern Mediterranean Jewish population, they have been frequently denounced by some rabbinical authorities as mere superstition. "The artifacts are from another time and place. Yet most of these objects would be as much at home in Jewish life today as in any time gone by. […] While the artistic forms of Jewish ceremonial art vary in response to the different periods and environments in which they are made, the functions of Judaic objects are rooted in time-honored laws and traditions.10"
The Bernice and Henry Tumen collection demonstrates the complex interactions between tradition and continuity and art and beauty in the substance of everyday life. 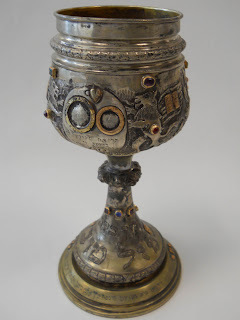 This collection represents an invaluable resource for any student of nineteenth- and twentieth-century European Jewish history, intercultural studies, religious ceremonies and ceremonials, Jewish symbols and superstitions, silverwork and jewelry studies, and even the art of collecting itself. For more information regarding the Bernice and Henry Tumen collection, please consult the finding aid, available here. 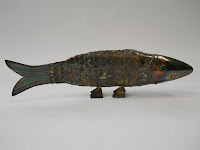 A portion of the Tumen collection is on display in the cases on the mezzanine level of Goldfarb Library. 1. Mann, Vivian B. and Bilski, Emily D. The Jewish Museum New York. Scala Books, 1993, 18. 2. Hertzberg, Arthur. Judaism. New York: Braziller, 1961, 73-74. 3. Altshuler, David, ed. 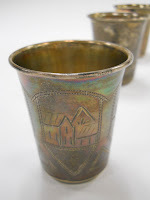 The Precious Legacy: Judaic Treasures from the Czechoslovak State Collections. New York: Summit Books, 1983, 122. 4. Kanof, Abram. 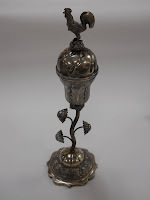 Jewish Ceremonial Art and Religious Observance. New York: Harry N. Abrams, Inc., 1970, 9. 5. Duran, Profiat. Sefer Ma’aseh Efod. Vienna: Yom-Tov Friedlander and Jacob haKohen, 1891, 19. 7. Kayser, Stephen S., ed. 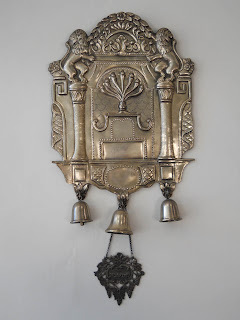 Jewish Ceremonial Art. The Jewish Publication Society of America: Philadelphia, 1955, 89. 10. Altschuler, ed. The Precious Legacy. New York: Summit Books, 1983, 207. 12. Heschel, Abraham Joshua. Man’s Quest for God. New York, 1954, 5.